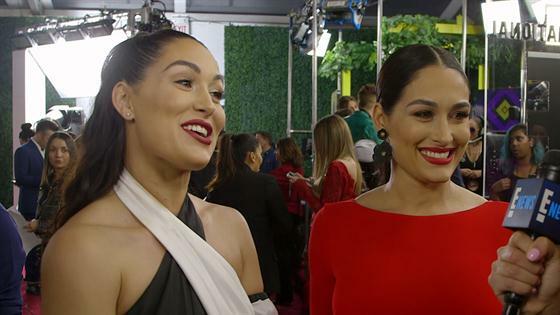 Bella Twins Gush Over PCA Noms & New Season of "Total Bellas"
2019 will be a big year for Nikki Bella and Brie Bella. The Bella Twins declared that's what they're expecting out of the upcoming New Year during an exclusive chat on the red carpet at the 2018 E! People's Choice Awards. Specifically, Brie revealed she and husband Bryan Danielson (known as Daniel Bryan professionally) are eager to give daughter Birdie Joe Danielson a sibling in 2019. "I might be doing a little baby making for no. 2," Brie teased. "Birdie's 18-months, I'm gonna be 35 next week…I think it's time!" And from what we've learned, it appears the Total Divas stars are hoping for a little boy. "My husband would love a boy, but because I have a sister I would love for Birdie to have a sister," the Belle Radici boss continued. "He's dying to have a boy because he's the last Danielson. I guess it's very important for men to keep the name going." As for Nikki? Her 2019 goals are more business centric. Per the wrestling expert herself, she is ready to take the business world by storm as she hopes to "conquer more vineyards, boardrooms and the fashion industry." We assume Nikki is also looking forward to next year after having her private life heavily reported on. Nonetheless, the Total Bellas star has overcome quite a bit and has even written some poetry about her transformative year. Apparently, the poetry writing came about thanks to a girls' trip to Lake Tahoe with her Total Divas peers. "In Tahoe we were trying to conquer our fears," the WWE veteran explained. "It was just my surroundings, with the women, what has happened…stuff that happened in their lives and I literally just wrote that week being around everyone." Thankfully, fans will be able to get a taste of how Brie and Nikki have grown by tuning into Total Bellas season 4 when it premieres. However, if you can't wait until then, you can always catch Total Divas when it airs on Wednesday at 9 p.m.
Catch Nikki and Brie's exclusive red carpet chat for yourself in the clip above!